The following image is the technical drawing and photo for spray suppressant clip. 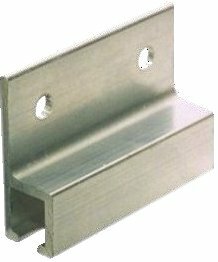 Part # CLIP-HA-2 The H section long clip is great for attaching rigid spray suppressant to trailers. Place them approx. 450mm apart. A very inexpensive way to attach spray suppressant. Made from aluminium for corrosion resistance.